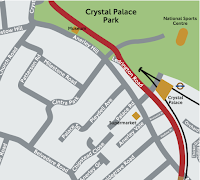 TfL have published the results of their consultation to choose a route for the Tramlink Extension to Crystal Palace. 67% preferred Option 2 (illustrated right), which runs directly past Crystal Palace station, with minimal on-street running. Although the press release says it will "run off-street along the existing railway line", this is slightly misleading. The railway is in a cutting and trams will run alongside it on the embankment, which will require ripping up a lot of trees but hopefully only minor demolition (see the left side of the tracks in this Google Map). The actual route will be decided by the end of the year, with opening due in 2013 if everything is approved.